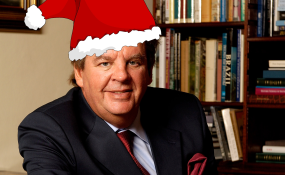 The EFF has lashed out at business tycoon Johann Rupert, saying it is "pleased that finally the ultimate face of white privilege has been exposed for the whole country and our people to see". The party accused Rupert of being arrogant, racist and suffering from cognitive dissonance on Tuesday evening during an event hosted by Power FM. The multi-billionaire was a guest on the "Chairman's Conversation", an annual event hosted by the radio station's founder, Given Mkhari, News24 earlier reported. Rupert, who is chair of the Swiss-based luxury goods company Richemont and South African-based company Remgro, faced tough questions from the Johannesburg crowd following a two-hour one-on-one conversation with Mkhari in which he touched on various topics including corruption, land expropriation, investor confidence, building a sustainable business and the Afrikaner Broederbond. "That's the reason. In a sense, the Afrikaner was downtrodden - the poor white question. But they were driven. They studied like crazy, they saved like crazy. "They didn't go and buy BMWs and hang around at [high-end Johannesburg night clubs] Taboo or The Sands all the time." The EFF on Wednesday described Rupert as "an arrogant white Afrikaner who sees nothing beyond his selfish racist white capitalist interests". "[The] EFF has always warned [South Africa] about Johann Rupert, who is actually a president of whites in South Africa," EFF spokesperson Mbuyiseni Ndlozi said in a statement. "We have told the country about him for many years. "Nevertheless, we commend all those blacks that confronted him, his racism and his arrogance. All black people now know who Johann Rupert is. They know who controls major wealth and business in on our land." In response to a black farmer who called him arrogant, and a member of the Black Management Forum (BMF) who said young black professionals should deduce from the interview that they were now "on their own", Rupert said he had endured attacks from the BMF for years without responding to them. "I've said the big problem in this country [is] instead of people debating facts, they get personal, they attack individuals and attack their children and that's a Donald Trump-type style. I think all of us are adult enough to debate issues. But why get personal all the time? We carry on like this, the other side loses interest very quickly. "Our country's got very serious problems, best illustrated by the clear division tonight. There's clear hatred, there is clear animosity and insults. Quite frankly, if that's the attitude I can tell you that we're going to have serious problems in this country. Quite frankly, I'm very happy not to get involved. I'm quite happy to spend time with friends and children and not to help. There are many other countries where you don't get insulted like this." "I'm toxic. You Shangaans have made me toxic, well, Vendas, sorry. There's a little Venda with a red beret. You guys have made me toxic." In response to a comment made by the businessman during the interview, Ndlozi said: "As the EFF, we do not take it lightly that Johann Rupert says when we come for him, he has taxi people to protect him." "This is a direct threat and it is no secret that white privilege has used some in the taxi business in the past to cause black divisions and black on black violence: all in the name of protecting white privilege. "It is obvious that EFF is a nightmare to Rupert and for that we are eternally proud. No one who protects and speaks in the interest of white privilege must ever sleep peacefully as long as EFF exists." One audience member said Rupert's white privilege had helped enable his current level of wealth and suggested that he use some of it to help boost young black entrepreneurs in Mamelodi. Rupert responded: "I've tried my best. My people, who work with me are happy. They've all got homes, I look after their kids and give them bursaries, and I'm not Father Christmas that can look after the whole country. "I've been luckier than I thought I would, I made more money than I thought I would and that I often think I deserve and my mother taught me to share, and I really give away a lot more money than I spend on our family. Quite frankly, I don't need lessons in sharing, because I know what I do and luckily the people close to me know what I do," Rupert said. Ndlozi said the EFF urged black people to accept that they are on their own. "It is embarrassing to see some blacks beg for recognition from an overtly unapologetic white racist. No amount of appeal to the generosity of white arrogance will take us anywhere. Like Steve Biko said, 'black man you are on your own'," Ndlozi said.